They say Thanksgiving is all about the sides, and as someone who doesn’t partake in turkey, it’s safe to say that I agree. 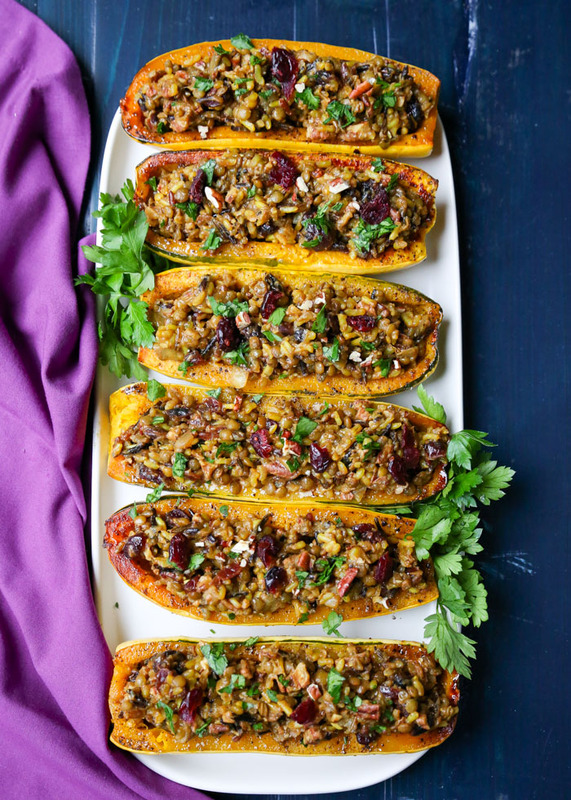 This here’s a side that I’m pretty excited about, too: Wild Rice & Lentil Stuffed Delicata Squash. This recipe uses what is apparently my favorite winter squash to cook with this year, delicata squash. I’ve had these things in bowls, baskets, rolling around on my kitchen counter, and roasting in my oven all season long. Love the things, just love ’em. This stuffed delicata squash might be my application so far. A nice, hearty wild rice pilaf, amped up with French green lentils, flavored with curry powder and cumin, and dotted with dried cranberries and pecans. So good on its own. BUT WAIT. There’s more. While the pilaf is cooking up to perfection, just go ahead and roast up your delicata squash, because we’re about to elevate it to something special. 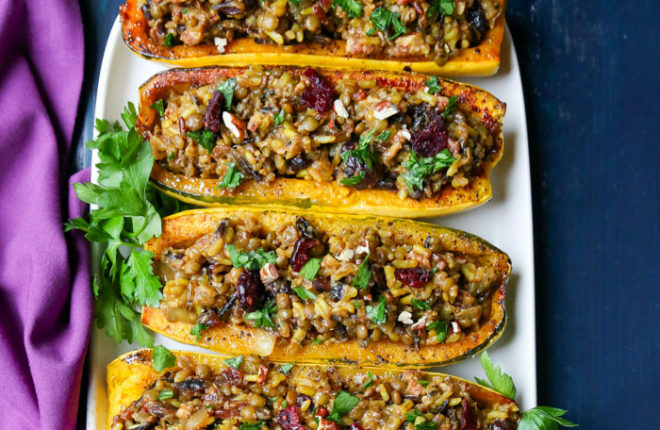 Once your pilaf is done and your squash is roasted, just fill in your little squash boats, sprinkle with parsley, and away you go. Can’t you just see this on your Thanksgiving table? Oh and did I mention these bad boys are vegan AND gluten-free? Perfect for when you have guests with special diets – just cover ’em all in one swoop. Well, and if you have anyone with nut allergies coming to the table, you could totally leave those out too – this dish is still plenty delicious without. Make the pilaf. Set a large saute pan with lid (or a medium dutch oven) over low heat. Add the olive oil. When hot, add the onion. Cook, stirring occasionally, until translucent, about 8 minutes. Add the rice and cook, stirring frequently, until a few pieces of the rice start to get golden on the ends, about 3 minutes. Add the garlic, 1 teaspoon curry powder, cumin, salt, and pepper and cook, stirring frequently, for one more minute. Add 3 cups of the vegetable broth, the brown sugar, and the lentils. Increase heat to high and bring to a boil. Then reduce heat to a simmer, stir, and cover. Set the timer for 40 minutes, stirring occasionally. If the mixture begins to get too dry before being cooked all of the way, add additional broth. If the mixture seems too wet after cooking for awhile, vent the pan to help some of the liquid evaporate. I’ve found making the pilaf is not an exact science as each pan is different, so just monitor your pilaf as it cooks. Pilaf is done when it’s relatively dry and the lentils and rice are tender, about 40 minutes. Remove pilaf from heat and stir the dried cranberries and chopped pecans. Taste and add the remaining teaspoon of curry powder and more salt and pepper if you wish. Meanwhile, while the pilaf cooks, prepare the delicata squash. Cut the stems off the ends, half lengthwise, scrape the seeds out with a spoon, and brush the inside of each half with olive oil. Sprinkle with salt and pepper and place cut side down on a large baking sheet. Bake for about 20 minutes, until fork-tender and golden around the edges. Remove from oven. 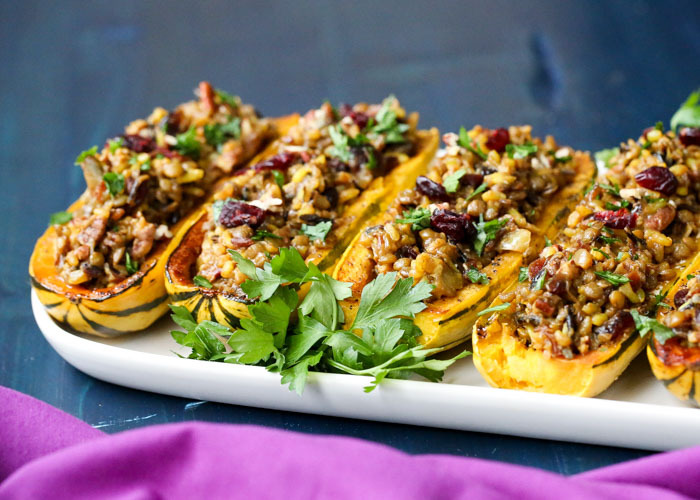 When ready to serve, flip over the delicata squash and spoon pilaf into the squash halves. I like to mound it just a bit but not too much or serving will become interesting (as in messy). You may have some pilaf left over. Transfer to serving plate and sprinkle chopped parsley over the top. Serve. 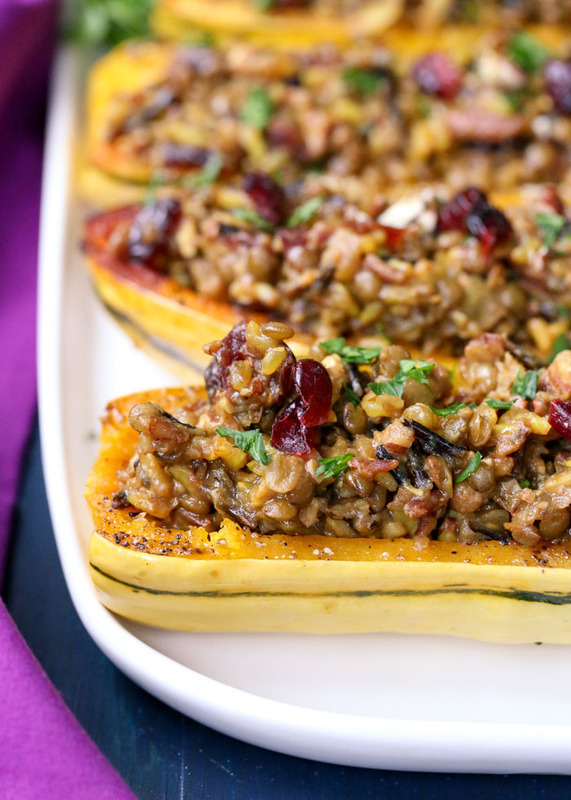 You can make the pilaf and roast the squash ahead of time and refrigerate for up to two days. 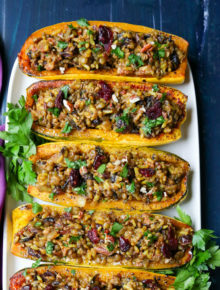 Spoon pilaf into the squash and bake at 350 degrees for 20-25 minutes to warm them through. * The heat in curry powders can really vary, so I recommend you start with 1 teaspoon and, if you’d like a bit more, add another teaspoon at the end.